1. Kaewkhao, J., 2004 , Determination of Efficiency for NaI(Tl) Detector by Intrinsic Peak Efficiency, Rajabhat Nakorn Pathom Science and Technology Journal, pp. 11-14. 2. Kaewkhao, J. and Chewpraditkul, W. , 2005 , Comparative study of NaI(Tl and CsI(Na) Scintillation Crystal for Gamma-Ray Spectroscopy , The Proceeding of 43th Kasetsart University Annual Conference, Bangkok, Thailand, 1-4 January 2005, pp. 261-268. 3. Kaewkhao, J. and Chewpraditkul, W. , 2005 , Simple NaI(Tl) Detectors, The 15th Annual Meeting on Science and Mathematics in School, Surathani, Thailand, 26-28January 2005, p. 52. 4. Kaewkhao, J. and Chewpraditkul, W. , 2005 , General Characteristics of CsI(Na) Scintillation Crystal, The 4 th Annual Meeting on Science and Technology, Thammasat University, Phatumthani, Thailand, 16 March 2005, p-12 (Full Paper Available on CD Proceeding). 5. Chewpraditkul, W., Kaewkhao, J., Sakthong, O., 2005, “Comparative Study of NaI:Tl and CsI:Na Scintillators” , Proceedings of the 31st Congress on Science and Technology of Thailand, Suranaree University of Technology, Nakornrachaseema, Thailand, October 18 – 20, p193. (Full Paper Available on CD Proceeding). 6. Pattanaboonmee, N., Kaewkhao, J., 2006, “Frustrated Total Internal Refection Fingerprint Capture Device”, The 16th Annual Meeting on Science and Mathematics in School, Ubon Rajathanee University, Thailand, 20-23 January 2006, p. 159. 7. Kaewkhao, J., Pattanaboonmee, N., 2006, “Study of Parameters for Scintillation Detector in gamma ray measurements”, The 16th Annual Meeting on Science and Mathematics in School, Ubon Rajathanee University, Thailand, 20-23 January 2006, p. 151. 9. Kaewkhao, J., Laopaiboon, J., Laopaiboon, R., Pencharee, S., and Chewpraditkul, W., 2006, Prepare the Bismuth Silicate (Bi12SiO20) Polycrystal for Single Crystal Growth, Proceedings of the 32st Congress on Science and Technology of Thailand, Chulalongkorn University, Bangkok, Thailand, October 10 – 12, p205. (Full Paper Available on CD Proceeding). 10. Kaewkhao, J., Comtamul, T., Laopaiboon, J., Laopaiboon, R., and Chewpraditkul, W.2007, Effect of Copper (ll) Oxide to Glass Properties from Local Sand in Nakorn Pathom Province , Proceedings of the 2nd Siam Physic Congress, The Rose Gaeden Riverside, Nakorn Pathom, Thailand, March 22 – 24, p. 23. 11. Kaewkhao J. , Homhuan S. , Junmane S., Laopaiboon J. and Chewpraditkul W. , 2007, “Study on Bi2O3 Doped Glasses from Local Sand”, Proceedings of the 33st Congress on Science and Technology of Thailand, Walailak University, Nakornsritammarach, Thailand, October 18 – 20, p. 221. (Full Paper Available on CD Proceeding). 12. Kaewkhao J. , Laopaiboon J. and Chewpraditkul W. , 2007, “Software for Calculate Effective Atomic Number from Transmission Experiment”, Proceedings of the 33st Congress on Science and Technology of Thailand, Walailak University, Nakornsritammarach, Thailand, October 18 – 20, p. 201. (Full Paper Available on CD Proceeding). 13. Changjan A. and Kaewkhao J., 2007, “ A Simple Method for Bernoulli’s Principle Experiment” Proceedings of the 33st Congress on Science and Technology of Thailand, Walailak University, Nakornsritammarach, Thailand, October 18 – 20, p. 309. (Full Paper Available on CD Proceeding). 14. Kedkaew, C., Kaewkhao, J. and Limsuwan P., 2008, “The Study of Optical and Magnetic Properties of Glass Doped with MnO2”, The Proceedings of 46th Kasetsart University Annual Conference. , January 29 - Fabuary 2, pp.539-543. 15. Kaewkhao, J., 2008, “Jahn-Teller Effect of Cu2+ in Glasses from Local Sand”, The Proceedings of 46th Kasetsart University Annual Conference, January 29 - Fabuary 2, pp.495-500. 16. Kaewkhao, J., Kruasri, T. and Pokaipasit A., 2008, Study on Optical and Physical Properties of Glass from Local Sand Doped with CeO2 , Proceedings of the 3nd Siam Physic Congress, Khao Yai, Nakorn Ratchasima, Thailand, March 20– 22, p. 151. 17. Kaewkhao J. , Udomkan N. and Chewpraditkul W. , 2008, “Optical Band Gap of Bismuth Borate Glasses”, Proceedings of the 34st Congress on Science and Technology of Thailand, King Mongkut's Institute of Technology Ladkrabang, Bangkok, Thailand, October 31 – November 2, (Full Paper Available on CD Proceeding). 18. Kaewkhao J. , Tuscharoen S. and Chewpraditkul W. , 2008, “Radiation Shielding Properties of Bismuth Barium Borate Glass at 662 keV”, Proceedings of the 34st Congress on Science and Technology of Thailand, King Mongkut's Institute of Technology Ladkrabang, Bangkok, Thailand, October 31 – November 2, (Full Paper Available on CD Proceeding). 19. Tuscharoen, S., Kaewkhao, J, Mungchamnankit, A. and Chewpraditkul W. , 2008, “Study on Properties of Barium Borate Glass System”, Proceedings of the 34st Congress on Science and Technology of Thailand, King Mongkut's Institute of Technology Ladkrabang, Bangkok, Thailand, October 31 – November 2, (Full Paper Available on CD Proceeding). 20. Kuruthomajaru, S., Kaewkhao, J and Udomkan, N., 2008, “Temperature Effects on A.GRANLULOSE as Investigates by XRD Techniques”, Proceedings of the 34st Congress on Science and Technology of Thailand, King Mongkut's Institute of Technology Ladkrabang, Bangkok, Thailand, October 31 – November 2, (Full Paper Available on CD Proceeding). 21. Montreevong, S., Patchparnkan, P., Jeingcharoenroj, I., Prongsamrong, P. and Kaewkhao J., 2009, “Fabrication of Lead-Free High Refractive Index Glasses from Local Sand”, The 19th Annual Meeting on Science and Mathematics in School, Puket Rajabhat University, Thailand, 26-29, January 2009, p. 137. 22. Kedkaew, C., Kaewkhao, J. and Limsuwan P., 2008, “Electron Spin Resonance (ESR) and Optical Absorption Spectra of Manganese Doped Soda-Lime-Silicate Glass System”, The Proceedings of 47th Kasetsart University Annual Conference. , March 17 - March 20, pp.358-364. 23. Kaewkhao, J. Ruangtaweep Y., Udomkan N. and Limsuwan P., 2009, “Optical Absorption Study of CoO in glass Prepare from Local Sand ”, The Proceedings of 47th Kasetsart University Annual Conference, March 17 - March 20, pp.374-379. 24. Thoum-on, A., Sanechop, U., Kanchanakul, P. and Kaewkhao. J., , 2009, “Effect of Colorant Chemical Substance to Properties of Glass for Imitation Gem Production”, Proceedings of the 4th Siam Physic Congress, Cha-am, Phetchaburi, Thailand, March 19– 21, p. 203. 25. Chimalawong, P., Kaewkhao. J. and Limsuwan. P., 2009, “Optical Spectra of Nd3+ Doped with Soda-Lime-Silicate Glass System”, Proceedings of the 4th Siam Physic Congress, Cha-am, Phetchaburi, Thailand, March 19– 21, p. 211. 26. Tuscharoen, S., Kaewkhao. J., Boonyapakorn, N. and Prongsamrong. P., 2009, “Optical Properties of (100-x)B2O3:xBaO Glass System”, Proceedings of the 4th Siam Physic Congress, Cha-am, Phetchaburi, Thailand, March 19– 21, p. 227. 27. Kaewwiset, W., Kaewkhao. J., Mungchamnankit, A. and Limsuwan. P., 2009, “Study on Er2O3 Doped Soda-Lime-Silicate Glass”, Proceedings of the 4th Siam Physic Congress, Cha-am, Phetchaburi, Thailand, March 19– 21, p. 237. 28. Limkitjaroenporn, P., Kaewkhao. J., Touscharoen, S. and Chewpraditkul, W., 2009, “The Mass Attenuation Coefficients of PbO-Na2O-B2O3 Glasses System at Gamma-Rays Energy 662 keV”, Proceedings of the 4th Siam Physic Congress, Cha-am, Phetchaburi, Thailand, March 19– 21, p. 251. 29. Thoum-on, A., Sanechop, U., Jungcharoenroj, I. and Kaewkhao. J., , 2009, “Effect of Colorant Chemical Substance to Hardnesss of Glass for Imitation Gem Production”, Proceedings of the 1st National Conference on Industrial and Research Project for Undergraduate Students (IRPUSCON-01), Bangkok, Thailand, March, 27– 29, p. 118-123. 30. Kaewwiset, W., Kaewkhao, J. and Limsuwan, P., 2009 “Optical Investigation and Electronics Polarizability of Er3+ Doped in Soda-Lime Silicate Glass” Proceedings of the 2nd National Conference on Science and Technology (NCST 2009), Sakon Nakhon Rajabhat University, Thailand, July, 9– 10, p. 26. 31. Srisittipokakun, N., Keadkaew, C., Kaewkhao, J. and Limsuwan, P., 2009 “Coloration of Mangase Doped Soda Lime Silicate Glass System” Proceedings of the 2nd National Conference on Science and Technology (NCST 2009), Sakon Nakhon Rajabhat University, Thailand, July, 9– 10, p. 42. 32. Chimalawong, P., Kaewkhao, J. and Limsuwan, P., 2009 “Effect of Nd2O3 Content on the Optical Band Gap, Density and Electronics Polarizability of SiO2-Na2O-CaO-Nd2O3 Glasses” Proceedings of the 2nd National Conference on Science and Technology (NCST 2009), Sakon Nakhon Rajabhat University, Thailand, July, 9– 10, p. 46. 33. Limkitjaroenporn, P., Kaewkhao, J. and Chewpraditkul, W., 2009 “Measurement of Mass Attenuation Coefficients and Effective Atomic Numbers for Lead Sodium Borate Glass System Using Gamma-Rays Energy at 662 keV” Proceedings of the 2nd National Conference on Science and Technology (NCST 2009), Sakon Nakhon Rajabhat University, Thailand, July, 9– 10, p. 48. 34. Kaewkhao, J., Chewpraditkul, W. and Limsuwan, P., 2009 “Fabrication of Lead-Free Radiation Shielding Glass” Proceedings of the 2nd National Conference on Science and Technology (NCST 2009), Sakon Nakhon Rajabhat University, Thailand, July, 9– 10, p. 67. 35. Kuruthomajaru, S., Kaewkhao, J and Udomkan, N., 2009, “Effects of Treatment Temperature on Phase Change of Ground Shell of A. Grannulose as Investigated by XRD and ESR Techniques” The Proceedings of the 3rd Congress on Ubon Rajathanee University Research, Ubon Rajathanee University, Ubon Rajathanee, Thailand, 28-29 July 2006, pp. 285-290. 36. Kaewkhao, J., Chewpraditkul, W. and Limsuwan, P., 2009 “Gamma-Rays Attenuation Studies of Bismuth-Barium-Borate Glass System” Proceedings of the 2nd Thailand Research Symposium 2009, National Research Council of Thailand, Bangkok Convention Center, Central World Plaza, Thailand, August, 26– 30, p. 121. 37. Chantima, N., Kaewkhao, J., Touscharoen, S. and Limsuwan, P., 2009, “Study of Effective Atomic Numbers and Mass Attenuation Coefficients in Bismuth Silicate Glass System” Proceedings of the 35st Congress on Science and Technology of Thailand, Burapa University, Thailand, October 15 – 17, (Full Paper Available on CD Proceeding). 38. Kaewwiset, W., Kaewkhao, J. and Limsuwan, P., 2009, “Optical Properties Investigation on Er3+ Doped Soda Lime Silicate glass” Proceedings of the 35st Congress on Science and Technology of Thailand, Burapa University, Thailand, October 15 – 17, (Full Paper Available on CD Proceeding). 39. Kaewkhao, J., Fakcharoenpol, N., Sriwaleerat, P., Pokaipisit, A. and Limsuwan, P., 2009, “Comparative Study of PbO in Silicate and Borate Glass for Gamma-Rays Shielding Materials” Proceedings of the 35st Congress on Science and Technology of Thailand, Burapa University, Thailand, October 15 – 17, (Full Paper Available on CD Proceeding). 40. Tuscharoen, S., Boonyopakorn, N., Chayarun, W., Kaewkhao. J., Limsuwan, P. and Chewpraditkul. W., 2009, “Effect of MO (M=Sr,Ba) on the Physical Properties of MO-B2O3-SiO2 Glass”, Proceedings of the 2nd PSU Phuket Research Conference, Prince of Songkla University, Phuket, Thailand, March 18– 20, p. 8. 41. Chanthima, N., Kaewkhao, J., Kedkaew, C. and Limsuwan P., 2010, “Study on Mass Attenuation Coefficients and Effective Atomic Numbers of (Bi2O3)x(SiO2)1-x Glasses System in the Energy Range 1 keV-100 GeV ”, The Proceedings of 48th Kasetsart University Annual Conference, February 3 - February 5, pp.300-307. 42. Tuschareon, T., Boonyopakorn, N., Chayarun, W., Kaewkhao, J., Limsuwan P. and Chewpraditkul, W., 2010, “Physical and Optical Properties of Barium Borosilicate Glasses”, The Proceedings of 48th Kasetsart University Annual Conference, February 3 - February 5, pp.349-355. 43. Boonin, K., Kaewkhao, J. and Limsuwan, P., 2010, “Effect of Er3+ to Physical and Optical Properties of Bi2O3-B2O3 Glass System”, Proceedings of the 5th Siam Physic Congress, Sai Yok, Kanchanaburi, Thailand, March 25– 27, p. 197. 44. Srisittipokakun, N., Kaewkhao, J.,, Keadkaew, C., and Limsuwan, P., 2010, “Comparative Study on Effect of Manganese Doped in Soda-Lime-Silicate and Soda-Lime-Borate Glass System”, Proceedings of the 5th Siam Physic Congress, Sai Yok, Kanchanaburi, Thailand, March 25– 27, p. 198. 45. Ruangthaweep, Y., Kittiauchawal, T., Kaewkhao, J., Mungchamnankit, A., Thamaphat, K. and Limsuwan, P., 2010, “Study of ESR Spectra for Fe3+ Ions in Soda-Lime-Silica Glass”, Proceedings of the 5th Siam Physic Congress, Sai Yok, Kanchanaburi, Thailand, March 25– 27, p. 206. 46. Kaewkhao, J., Tuscharoen, S., Pongtawee, S. and Limsuwan, P., 2010, “Investigation on Physical and Optical Properties of PbO-CaO-P2O5 Glass System”, Proceedings of the 5th Siam Physic Congress, Sai Yok, Kanchanaburi, Thailand, March 25– 27, p. 245. 47. Kaewkhao, J., Ngo-kok, N., Srisittipokakun, N., Keadkaew, C., Mungchamnankit, A. and Limsuwan, P., 2010, “Effect of Manganese (IV) oxide to Properties of Soda-lime Silicate System”, Proceedings of the RSU Research Conference, Rangsit University, Thailand, April 1, p. 42-45. 48. Mungchamnankit, A., Kaewkhao, J. and Limsywan P., 2010, “Effect of CeO2 to properties of soda lime silicate glass” Proceedings of the 36st Congress on Science and Technology of Thailand, Bangkok International Trade and Exhibition Center (BITEC), Thailand, October 26 – 28, p. 143. (Full Paper Available on CD Proceeding). 49. Chanthima, N., Kaewkhao, J. and Limsuwan P., 2010, “Study of effective atomic numbers for photon energy-absorption of barium silicate glass system in the energy range 1 keV to 20 MeV ” Proceedings of the 36st Congress on Science and Technology of Thailand, Bangkok International Trade and Exhibition Center (BITEC), Thailand, October 26 – 28, p. 144. (Full Paper Available on CD Proceeding). 50. Chaiphaksa, W., Kaewkhao, J., Ratana, T., Kedkaew, C., Pudwat, S. and Limsuwan P., 2010, “Structure and magnetic properties of glass doped with high Fe2O3 content” Proceedings of the 36st Congress on Science and Technology of Thailand, Bangkok International Trade and Exhibition Center (BITEC), Thailand, October 26 – 28, p. 148. (Full Paper Available on CD Proceeding). 51. Tuscharoen, S., Kaewkhao, J., and Limsuwan P., 2010, “The physical properties of SrO-B2O3-SiO2 glass system” Proceedings of the 36st Congress on Science and Technology of Thailand, Bangkok International Trade and Exhibition Center (BITEC), Thailand, October 26 – 28, p. 149. (Full Paper Available on CD Proceeding). 52. Kirdsiri, K., Kaewkhao, J., and Limsuwan P., 2010, “Effect of PbO to structural and shielding properties of borate glass system” Proceedings of the 36st Congress on Science and Technology of Thailand, Bangkok International Trade and Exhibition Center (BITEC), Thailand, October 26 – 28, p. 166-167. (Full Paper Available on CD Proceeding). 53. Kaewkhao, J., Kedkaew, C., Pokaipisit, A. and Limsuwan P., 2010, “Effect of burning temperature to silica content and structure of biomass fly ashes in Thailand” Proceedings of the 36st Congress on Science and Technology of Thailand, Bangkok International Trade and Exhibition Center (BITEC), Thailand, October 26 – 28, pp.167-168. (Full Paper Available on CD Proceeding). 54. Chanthima, N., Kaewkhao, J. and Limsuwan P., 2011, “ Effective Atomic Numbers for Photon Energy Absorption Studies in Bismuth Silicate Glasses”, The Proceedings of 49th Kasetsart University Annual Conference, February 1 - February 4, pp.228-233. 55. Pangdumrongpanit, P., Kaewkhao, J., Limsuwan, P and Chewpraditkul, W., 2011, “Effect of Lead and Bismuth on Borosilicate Glass Properties: A Comparative Study”, Proceedings of the 6th Siam Physic Congress, Pattaya, Chonburi, Thailand, March 23 – 26, pp.107-110. 56. Kaewkhao, J., Kirdsiri, K., Chuenboonma, J. and Limsuwan, P., 2011, “Utilization of Coal Fly Ash in the Glass Production”, Proceedings of the 6th Siam Physic Congress, Pattaya, Chonburi, Thailand, March 23 – 26, pp.135-137. 57. Kirdsiri, K., Chaisaksakul, C., Kaewkhao, J., Srisittipokakul, N., Kedkaew, C. and Limsuwan, P., 2011, “Fabrication and Properties of Soda-Lime-Silicate Glass Doped with Fe2O3”, Proceedings of the 6th Siam Physic Congress, Pattaya, Chonburi, Thailand, March 23 – 26, pp.138-141. 58. Chimalawong, P., Kaewkhao, J., Kirdsiri, K., and Limsuwan, P., 2011, “Study the Physical and Optical Properties of Dy3+ in Soda-Lime-Silicate Glass System”, Proceedings of the 6th Siam Physic Congress, Pattaya, Chonburi, Thailand, March 23 – 26, pp.142-144. 59. Tuschareon, S., Projamthin, S, Kaewkhao, J., and Limsuwan, P., 2011, “Color Glass Production from Rice Husk Ash”, Proceedings of the 6th Siam Physic Congress, Pattaya, Chonburi, Thailand, March 23 – 26, pp.145-148. 60. Wanarak, C., Chewpraditkul, W., Phunpueok, A., and Kaewkhao, J., 2011, “Scintillation Properties of Ce-Doped LYSO and YSO Crystals”, Proceedings of the 6th Siam Physic Congress, Pattaya, Chonburi, Thailand, March 23 – 26, pp.292-295. 61. Chanthima, N., Kaewkhao, J., and Limsuwan, P., 2011, “Calculation of Shielding Properties of Barium Silicate Glass System Comparative with Standard Shielding Concrete in the Energy Range of 1 keV – 100 GeV”, Proceedings of the 6th Siam Physic Congress, Pattaya, Chonburi, Thailand, March 23 – 26, pp.296-299. 62. Boonyopakorn, N., Tuschareon, S., Prongsamrong, P. and Kaewkhao, J., 2011, “Effect of Annealing Temperature on Crystalline Structure and Electrical Property of AZO Films Prepared by Magnetron Sputtering”, Proceedings of the 6th Siam Physic Congress, Pattaya, Chonburi, Thailand, March 23 – 26, pp.363-365. 63. Chanthima, N., Kaewkhao, J. and Limsuwan, P., 2011, “Simulated Radiation Shielding Properties of Lead Silicate Glasses” The Proceedings of the 6th Conference on Science and Technology for Youths, Bangkok International Trade and Exhibition Center (BITEC), Bangkok, Thailand, June, 9-10, pp. 124-131. 64. Srisittipokakun, N., Kirdsiri, K. and Kaewkhao J., “Performance evaluation of a solar tunnel dryer for Lemon-grass drying”, Proceeding of the 3rd NPRU National Conference 2011, Nakhon Pathom Rajabhat University, Nakhon Pathom, 10 August 2011, Thailand. (Full Paper Available on CD Proceeding). 65. N. Srisittipokakun, Kaewkhao, J. and Limsuwan, P., “Effect of SrO doping on the physical and optical properties of borosilicate glass”, Proceeding of the 3rd NPRU National Conference 2011, Nakhon Pathom Rajabhat University, Nakhon Pathom, 10 August 2011, Thailand. (Full Paper Available on CD Proceeding). 66. Kirdsiri, K., Srisittipokakun, N. and Kaewkhao J., “Study of Mass Attenuation coefficients and Effective Atomic Numbers of Barium Borate Glass” Proceeding of the 3rd NPRU National Conference 2011, Nakhon Pathom Rajabhat University, Nakhon Pathom, 10 August 2011, Thailand. (Full Paper Available on CD Proceeding). 67. Limkitjaroenporn, P., Kaewkhao J., Limsuwan, P. and Chewpraditkul, W., “Design of the Compton Scattering Experiment for Measured Incident Photon and Electron Rest Mass Energies”, Proceeding of the 3rd NPRU National Conference 2011, Nakhon Pathom Rajabhat University, Nakhon Pathom, 10 August 2011, Thailand. (Full Paper Available on CD Proceeding). 68. Srisittipokakun, N., Kirdsiri, K. and Kaewkhao J., “DRYING OF PANDANUS TECTORIUS USING A DOUBLE COLLECTOR SOLAR TUNNEL DRYER”, Proceeding of 37th Congress on Science and Technology of Thailand, Mahidol University, 10-12 October 2011, Thailand, pp.351-352. (Full Paper Available on CD Proceeding). 69. Srisittipokakun, N., Kaewkhao J., and Limsuwan, P., “Optical characterization of Sr2+ ion-doped borosilicate glasses”, Proceeding of 37th Congress on Science and Technology of Thailand, Mahidol University, 10-12 October 2011, Thailand, p. 108. (Full Paper Available on CD Proceeding). 70. kirdsiri, K., Srisittipokakun, N., Kaewkhao J., and Limsuwan, P., “Effect of Barium to the Gamma Rays Shielding Properties in Different Photon Energy”, Proceeding of 37th Congress on Science and Technology of Thailand, 10-12 October 2011, Mahidol University, Thailand, p. 110. (Full Paper Available on CD Proceeding). 71. Limkitjaroenporn, P., Kaewkhao J., Limsuwan, P. and Chewpraditkul, W., 2011, “Verification of the Compton Energy and Determination of Electron Rest Mass”, Proceeding of 37th Congress on Science and Technology of Thailand, Mahidol University, 10-12 October 2011, Thailand, pp. 109-110. (Full Paper Available on CD Proceeding). 72. Limkitjaroenporn, P., Kaewkhao J., Seinsanor, S. and Chewpraditkul, W., 2012, “A Study of Differential Cross Sections for Compton Scattering of Pure Elements”, Proceedings of the 7th Siam Physic Congress, Phra Nakhon Si Ayutthaya, Thailand, May 9 – 12, pp. 164. 73. Kirdsiri, K., Srisittipokakun, N., Kaewkhao J., and Limsuwan, P., 2012, “Computational of Photon Interaction Parameters for Barium Phosphate Glasses in the Energy Region 1 keV – 100 GeV”, Proceedings of the 7th Siam Physic Congress, Phra Nakhon Si Ayutthaya, Thailand, May 9 – 12, pp. 165. 74. Limkitjaroenporn, P., Kaewkhao J., Limsuwan, P. and Chewpraditkul, W., 2012, “The Mass Attenuation Coefficients of Zircon Blue by using Compton Scattering Technique”, Proceedings of the 7th Siam Physic Congress, Phra Nakhon Si Ayutthaya, Thailand, May 9 – 12, pp. 226. 75. Kaewkhao J., Srisittipokakun, N., Ruangtaweep, Y. and Limsuwan, P., 2012, “Optical and Spectroscopic Properties of Lead and Zirconium on Borosilicate Glasses: A Comparative Study”, Proceedings of the 7th Siam Physic Congress, Phra Nakhon Si Ayutthaya, Thailand, May 9 – 12, pp. 238. 76. Apiworachai, P., Srisittipokakun, N., Kirdsiri, K., Sornsanit K., and Kaewkhao J., 2012, “Study on Compositions and Crystal Structures of Ashes from Biomass system” Proceedings The 4th Science Research Conference, Faculty of Science, Naresuan University, Thailand, 12-13 March 2012. pp. 202-205. 77. Srisittipokakun, N., Kirdsiri, K., Ruangtaweep, Y., and Kaewkhao J., 2012, “Optical Properties of Soda-Lime-Silicate and Soda-Lime-Borate Glass System Doped MnO2: A Comparative Study” Proceedings The 4th Science Research Conference, Faculty of Science, Naresuan University, Thailand, 12-13 March 2012. pp. 259-262. 78. Chinhagow, J., Kirdsiri, K., Srisittipokakum, N. and Kaewkhao, J., 2012, “Calculation of Radiation Attenuation Coefficients for Cement Containing with BaCO3 and PbO”, Proceedings The 4th NPRU National Academic Conference 2012, Nakhon Pathom Rajabhat University, Nakhon Pathom, Thailand, 12-13 July 2012. pp. 18. 79. Nuwan, L., Srisittipokakum, N., Kirdsiri, K., Chimalawong, P. and Kaewkhao, J., 2012, “Effect of Gd2O3 Doping on the Physical and Optical Properties of Soda Lime Silicate Glass”, Proceedings The 4th NPRU National Academic Conference 2012, Nakhon Pathom Rajabhat University, Nakhon Pathom, Thailand, 12-13 July 2012. pp. 19. 80. Limkitjaroenporn, P., Klangchanang, S., Insiripong, S. and Kaewkhao, J., 2012, “Study of the Effective Atomic Numbers of Tourmaline”, Proceedings The 4th NPRU National Academic Conference 2012, Nakhon Pathom Rajabhat University, Nakhon Pathom, Thailand, 12-13 July 2012. pp. 23. 81. Tuscharoen, S., Kattiya, P. and Kaewkhao, J., 2012, “Measurement of Mechanical Properties of Materials by Ultrasonic Nondestructive Technique”, Proceedings The 4th NPRU National Academic Conference 2012, Nakhon Pathom Rajabhat University, Nakhon Pathom, Thailand, 12-13 July 2012. pp. 24. 82. Reungtaweep, Y., Reungsri, S., Anuphan, P. and Kaewkhao, J., 2012, “Effect of SnO2 on Properties of Glass Doped with Gold Particles”, Proceedings The 4th NPRU National Academic Conference 2012, Nakhon Pathom Rajabhat University, Nakhon Pathom, Thailand, 12-13 July 2012. pp. 26. 83. Boonin, K., Ruabkomsan, J., Reungtaweep, Y. and Kaewkhao, J., 2012, “Effect of CaO on Properties of Glasses Prepared from Rice Husk Ash”, Proceedings The 4th NPRU National Academic Conference 2012, Nakhon Pathom Rajabhat University, Nakhon Pathom, Thailand, 12-13 July 2012. pp. 27. 84. Chanthima, N. and Kaewkhao J., “Calculation of Mass Attenuation Coefficient and Related Parameters of BaO-SiO2 Glass system by WinXCom and FFAST”, Proceeding of 38th Congress on Science and Technology of Thailand, Empress Convention Centre, Chiang Mai, Thailand, 17-19 October 2012, p. 73. (Full Paper Available on CD Proceeding). 85. Insiripong, S., Chanthima, N. and Kaewkhao J., “Interaction of Photon with Soda Lime Silicate Glass in Energies 1 keV to 100 GeV: IEEE Calculation”, Proceeding of 38th Congress on Science and Technology of Thailand, Empress Convention Centre, Chiang Mai, Thailand, 17-19 October 2012, p. 73. (Full Paper Available on CD Proceeding). 86. Kaewkhao, J., “Artificial Gemstones from glasses: Jewelry Industry Applications” Proceeding of 8th Annual Conference of the Thai Physics Society Siam Physics Congress (SPC2013) 21-23 March 2013, Chiangmai Grandview Hotel, Chiangmai, Thailand, p.14. 87. Angnanon, A., Kaewkhao, J., Kiitiauchawal T., Mungchanankit, A. and Ruangsri, A., 2013, “Ruby Enhancement by Heat Treatment”, Proceedings of the 5th NPRU National Academic Conference 2013, Nakhon Pathom Rajabhat University, Nakhon Pathom, Thailand, 18-19 July 2013. pp. 300. 88. Chanthima, N., Pounhlum, K., Junthamanee, K. Pongsuwan, S.and Kaewkhao, J., 2013, “Influence of Barium Addition on Properties of Borophosphate Glass System”, Proceedings of the 5th NPRU National Academic Conference 2013, Nakhon Pathom Rajabhat University, Nakhon Pathom, Thailand, 18-19 July 2013. pp. 302. 89. 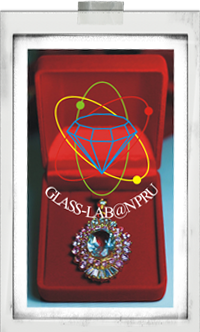 Kirdsiri, K., Thongdet, N., Boonprakom, N. and Kaewkhao, J., 2013, “Fabrication and Effect of ZnO on Physical and Optical Properties of Bismuth Borate Glass System”, Proceedings of the 5th NPRU National Academic Conference 2013, Nakhon Pathom Rajabhat University, Nakhon Pathom, Thailand, 18-19 July 2013. pp. 303. 90. Ruangrtaweep, Y., Kirdsiri, K., Rittiya, W. and Kaewkhao, J., 2013, “Study on Physical and Optical Properties of ZnO-Bi2O3-B2O3 Glasses doped with MnO2”, Proceedings of the 5th NPRU National Academic Conference 2013, Nakhon Pathom Rajabhat University, Nakhon Pathom, Thailand, 18-19 July 2013. pp. 304. 91. Preechayan,T., Chanthima, N. and Kaewkhao, J., “Comparative Study on Mass Attenuation Coefficients of Building Materials Containing with BaCO3 and PbCO3”, The 3rd Muban Chombueng Rajabhat University National Conference 2015, 1 March 2015, Muban Chombueng Rajabhat University, Thailand, pp. 19-25. 117. Kirdsiri, K. and Kaewkhao, J., “Investigation on Luminescence Property of Zinc Bismuth Borate Glasses Doped with Samarium Oxide”, Proceedings of 7th NPRU National Academic Conference, Nakhon Pathom Rajabhat University, Nakhon Pathom, Thailand, 30 – 31 March 2015.